We are here to honor and to celebrate your awakening. These are the times of a new cycle, a new beginning. We invite you to commit to the process of ascension that is unfolding. Yes, we understand that what you are witnessing and observing does not meet your ideal of ascension. Yet we remind you that this planet will not and cannot ascend until the dense misqualified energies have been transformed. We can almost hear the collective moan when this statement is read. We know that you have been actively doing your best for many experiences on the timeline to shift the collective consciousness and anchor a reality that is life sustaining for all. We acknowledge you for your true dedication and continued service to this global process. It is that focused dedication and service that has flushed these hidden, often suppressed, misqualified energies to the surface. These emotional patterns and attitudes of fear, self-righteousness, prejudice and anger have always been an aspect of the human energy field, as have a sense of lack, of unworthiness, not good enough, less than, hopelessness and helplessness. Now more than ever these very energy qualities are being brought to the forefront, to center stage of your current time. Most of these misqualified energies and patterns have been hidden, denied and suppressed by each and every individual. There are those who will act out these emotional energies in a covert, manipulative and often unconscious manner. In doing so, they truly distort and use their creative abilities in harmful and life suppressing actions. These dense misqualified emotional energies are often referred to as the shadow of the individual. They have been a part of the human consciousness since the beginning of your timeline. Remember this planet is a planet of duality, of opposites. So this hologame has offered the choices of good/bad, right/wrong, love/fear, separateness/oneness, light/dark, life-sustaining/life-diminishing. Every earthwalker on this planet is a multidimensional being of divine consciousness, choosing to enter this timeframe and play out these emotions. You understand that everyone is empathic, sensitive and able to feel the energy fields surrounding them. However, most individuals are totally unaware that they are feeling, responding to and acting out the emotions of those around them, of the collective field. So just imagine for a moment, as a divine being you entered this quantum field of energy called earth. You agreed to come to this dimension and reality to assist, to shift and uplift consciousness. You were actually excited to have the opportunity to experience misqualified energies and with your skills and awareness to transform them. 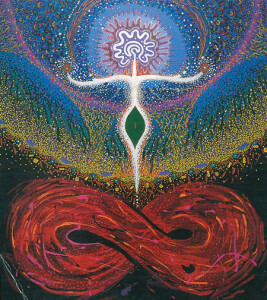 You wanted once again to experience the sensations of having a physical form and to bring forth your unique gifts and understanding acquired from other realms and dimensions. You wanted to continue your work and service in assisting the ascension process for this planet and humanity. From your non-physical divine awareness you understood that this is a dimension of opposites, which has and does create dense misqualified energy, unlike your unlimited divine self of oneness. You were also aware that once you embodied a physical form there was usually a veil of forgetfulness that would cloud your true understanding as a sentient. Yet your divine gifts remain available, so upon entering this reality as an infant, sensitive, empathic, and telepathic you immediately are immersed in the vibrations that surrounded you. As a child, you were feeling all the emotions being offered in your home or surroundings and yet not remembering how to deal with them or transform them. However, as an empathic being you literally take on the misqualified emotions and patterns of those around you. You quickly learned to shut them off, repress them, or deny them. Then those misqualified energies, those emotional patterns can and do get stored in the tissues, bones, cells and organs of the physical body. This human behavior has been constant for ages. Now there is an awakening. The shadow selves, the repressed emotions, of individuals are surfacing, they are being triggered, they are being acted out. Remember emotions are contagious. These misqualified emotions of anger, injustice, prejudice, fear, unfairness, inequality and suppression are arising fully to be bathed in the light of true understanding. Each and every enlightened multidimensional being is an alchemist here to transform all the misqualified, painful repressed patterns and emotions they acquired from their life experience. They are to own their shadow self of repressed emotions acquired from others and from their life experiences. As an alchemist, you personally have the birthright and the responsibility to transmute, to convert all incoherent emotions of pain, sorrow, rage, violence, rejection, of being unloved or abandoned into coherent emotions of understanding, forgiveness, peace, honor, respect and love. This is the moment in which you are most powerful. This is the moment that you desire to transform and uplift. When you feel any emotion that would be considered misqualified or using your term, negative, know without a doubt that you are energetically linked, entrained, and connected to the larger vibrational field of that peculiar feeling or pattern that has been generated and offered by others. Without judgment or hesitation, simply realize that some of your old repressed emotions have been triggered or activated. We invite you to step into your true essence as a divine agent of conscious light and transmute, release, the misqualified/negative energy you are feeling. This is the power of your remembering and owning that you are here in this dimension to do this very work. Each and every time you clear some personal prejudice, release some personal fear, each time you shift an emotional response from anger or judgment to forgiveness, love or gratitude, you are doing global work on a personal level. There are many ways to transmute your own shadow of negative memories, emotions and experiences. It is the willingness and the intention. There are many processes and techniques are available for this very important task. The use of sound is most effective. As an alchemist, remember to state “I am fully embodied, anchored to the planet and always connected to Divine Source.” Place you awareness in your heart, call upon divine beings to witness and support you as you transform the misqualified/negative energy you are feeling or are focused upon. Know that you are truly connected to the larger collective field of that emotion. Now, in the sacred space you have just created, give the misqualified/negative emotions a sound. The expression of emotions using pure sound vibrations, much like the delete button on your computers, is a method to clear old emotions that have been stored in your body file. Perhaps as a child you acquired or took on some emotional pattern from your parents, from others or from a painful experience you did not understand at the time. Expressing these old yet active emotions with sound vibrations can truly clear them. Once the old emotion is cleared, remember to name the new emotion you desire in its place. Perhaps it is peace or forgiveness or grace. Now sound that emotion. Be sure to acknowledge yourself for this work, thank the divine beings who witnessed this transformation. Know without a doubt that you have also cleared some aspect of the collective misqualified/negative shadow of humanity and replaced those patterns of emotions with a more coherent frequency. This is the service of a master. This is the power and practice of an alchemist. Remember you are here to transmute and transform energy through the alchemical chalice of your heart. 1 Response to "A Simple Sound Technique to Transform Personal and Collective Shadow"